Realist – the pragmatic producer who makes things happen. Critic – the eagle-eyed evaluator who refines what the Dreamer and Realist produce. Break down a meeting or a discussion into three stages – dreaming, thinking about implementation, and critical evaluation – working on each role as a separate phase. Make each stage clear and explicit. Rotate the roles to allow people to contribute from different perspectives. Walt Disney was very successful at turning fantasies into reality. The technique Disney Creativity Strategy was modelled and developed as NLP tool by Robert Dilts, an NLP pioneer and the author of Strategies of Genius. One of the goals of NLP is to model the thinking strategies of successful people. Dilts defined this particular strategy after analyzing Disney's methods for turning his dreams into reality. and popular appeal certainly qualifies him as a genius in the field of entertainment. In a way, Disney's chosen medium of expression, the animated film, characterizes the fundamental process of all genius: the ability to take something that exists in the imagination only and forge it into a physical existence that directly influences the experience of others in a positive way." writes Robert Dilts. 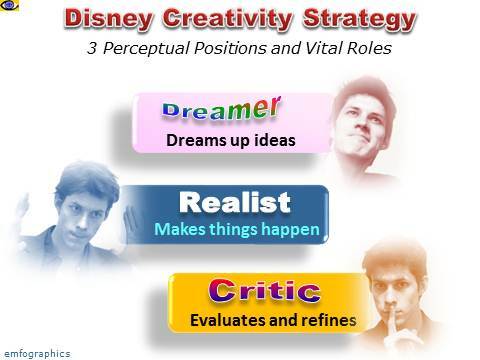 The Disney Creativity Strategy separates out three vital roles – dreamer, realist, and critic – involved in the process of generating creating ideas and translating them into reality. The roles are explored separately for maximum clarity and effect. Let your mind wander freely. → Produce a visionary big picture with no boundaries, limitations or restraint. Ask yourself "What do I really want, in an ideal world? "Do not let reality come into your thoughts. This is daydreaming or brainstorming time. It will most likely engage your visual imagination. Establish the payoffs of the idea. Test your plan, look for problems, difficulties and unintended consequences. Evaluate them. Ask yourself "What could go wrong?" Think of what is missing, what is surplus, what the spins-offs will be. Define the context in which your plan is workable and problematic. When creating stories, Walt Disney used 3 perceptual positions. Here is how Disney describes his creative process: "The story man must see clearly in his own mind how every piece of business in a story will be put. He should feel every expression, every reaction. He should get far enough away from his story to take a second look at it...to see whether there is any dead phase...to see whether the personalities are going to be interesting and appealing to the audience. He should also try to see that the things that his characters are doing are of an interesting nature." More important than the individual roles was Disney’s ability to strike the right balance between them. "→ Creativity as a total process involves the coordination of these three subprocesses: dreamer, realist and critic. A dreamer without a realist cannot turn ideas into tangible expressions. A critic and a dreamer without a realist just become stuck in a perpetual conflict. The dreamer and a realist might create things, but they might not achieve a high degree of quality without a critic. The critic helps to evaluate and refine the products of creativity," writes Dilts.